Home | New Releases | John Bye Open Edition Canvas Giclee:"Wild and Free"
John Bye Open Edition Canvas Giclee:"Wild and Free"
About the Art : “It’s the satisfaction of pushing formless gobs of paint around until they coalesce into something that looks real that excites me about painting. I’ve tried, unsuccessfully, to paint with less detail but that is not who I am. Leaving something incomplete, whether that be the subject or its environment, pains me to the point of madness” John was born on February 17, 1970 in Styvechale, Coventry. There have been artistic people throughout John’s family history and he has inherited his abilities. Self taught, John skills as an artist have grown with him. His aim is for each piece to capture the life and spirit of the subject he paints. His earlier works were in pencil and were mainly human subjects. John has experimented with various other mediums from oils, watercolors and pastels, eventually realizing that his favorite medium is acrylic. 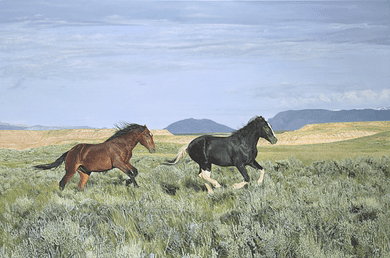 Home | Fine Art Prints & Limited Editions | Greenwich Workshop | NEW Greenwich Workshop Releases | John Bye Open Edition Canvas Giclee:"Wild and Free"
Home | Fine Art Prints & Limited Editions | Greenwich Workshop | John Bye | John Bye Open Edition Canvas Giclee:"Wild and Free"